Jan Mollenhauer’s project explores concepts of montage and spectrality to describe precarious afterlives of images within visual constellations intertwining Germany and the Black Atlantic between 1915 and 1962. In 1945, African American GIs, as members of the highly segregated US Army, stepped into the recently liberated concentration camp of Buchenwald. Some of the soldiers took photos around which the project’s visual constellation is centred. Between 1877 and the 1940s, »lynchings« amounted to mass spectacles in the United States, especially in the South. Photographs taken by whites were widely disseminated — among fellow whites as well as among African Americans. Early American, not least early African American film is deeply involved in the visual culture of Lynching. After 1945, however, that visuality changes. One no longer sees white voyeuristic mobs, but witnesses black families in mourning. Do the Buchenwald photos — imaginatively — restitute »grievability« (Butler)? Lynching’s particular body-image, along with the uncannily similar longue durée of racist stereotypes stemming from Weimar’s postcolonial film also inform the visuality of and around African American occupying forces and the droves of Black GIs following them in Germany after World War 2. The hugely successful film Toxi (Dir. : R.A. Stemmle, West Germany 1952) is symptomatic for this discourse, extending to fremd gehen. Gespräche mit meiner Freundin (Dir. : Eva Heldmann, Germany 1999). How do these images relate to the photos taken in Buchenwald? By actively providing »readability« (Didi-Huberman), Jan reflects upon the fractal, the hidden, and the haunting in the project’s material. William Alexander Scott III. 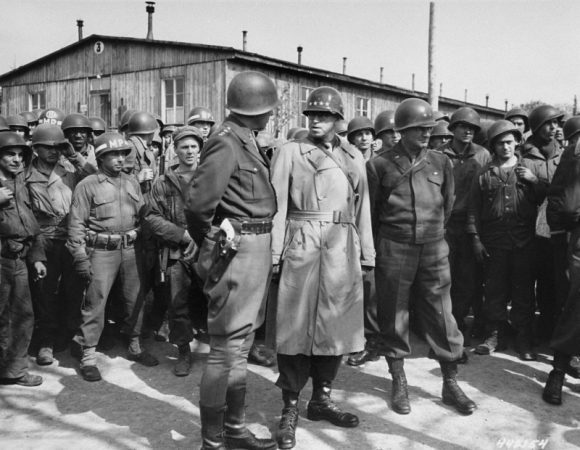 : George Patton (foreground, l.) speaks with Omar Bradley (middle) in the recently liberated forced labour camp Ohrdruf, close to Buchenwald, African American soldier in the background, April 1945. NARA, ID: 111-SC-442154.